short puffed sleeves or tailored cuffed sleeves; small round collar or large collar. Back buttoned bodice on both versions. Corded piping trim. Girls Size 10, Breast 28, Waist 24, Hip 32. Pattern is complete. The pieces have been carefully cut and folded. Envelope and contents are in very good condition. 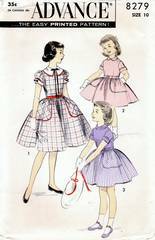 All of our vintage sewing patterns are stored in, and shipped with, acid free polypropylene archival sleeves and backing boards.